The traditional classification of the Order Primates was simple: the lemurs, lorises and tarsiers were grouped in the Suborder Prosimii, and the monkeys and apes in the Suborder Anthropoidea (cladogram (a)). The Prosimii were clearly paraphyletic, and they could be diagnosed only with respect to the Anthropoidea, in other words, by the absence of characters. A phyloge-netic approach then is bound to break up the classic Prosimii. An early cladistic analysis of primates (Andrews, 1988) suggested that tarsiers, or tarsiers plus omomyids (tarsiiforms), are the closest relatives of higher primates (cladogram (b)). This is based on characters shared by tarsiers and anthropoids in the region of the orbits, a shortened face and a shared type of placenta where the uterine wall is invaded by placental tissues. Tarsiiforms and anthropoids together form the clade Haplorhini. More recent reanalysis (Kay et al., 1997) suggests changes, with Adapiformes now a sister group of Lemuriformes, which are termed collectively the Strepsirrhini, and tarsiers and omomyids no longer forming a clade together (cladogram (c)). This view of phylogeny has gained wide acceptance, and molecular data confirm the framework of living forms, but clearly cannot test between the two hypotheses in cladograms (b) and (c) because the differences concern fossil groups. 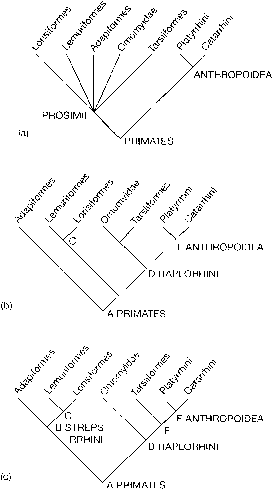 Three cladograms showing different patterns of postulated relationships of the major groups of primates: (a) the classic split into prosimians and anthropoids; (b) omomyids and tarsiers as closest relatives of anthropoids (Andrews 1988); and (c) resurrection of the Strepsirhini and Haplorhini (Kay et al, 1997). Synapomorphies, from Andrews (1988) and Kay etal. 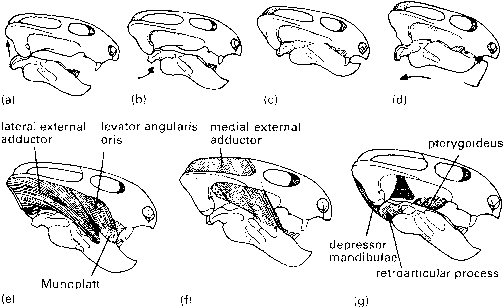 (1997): A PRIMATES, petrosal bulla, postorbital bar, large orbits, orbits are located close together and on the front of the face, large braincase, modifications of the elbow to allow extra flexibility, modifications of the tarsus, opposable thumb, nails on the digits; B STREPSIRRHINI, ring-shaped tympanic bone enclosed within the tympanic cavity, posterolateral and dorsal position of the posterior carotid foramen, as well as characters of the hand and foot; C LEMURIFORMES sensulato, grooming claw on second toe, dental tooth comb made from forwards-projecting lower incisors and canines; D HAPLORHINI, haplorhine nose (nostrils have complete margins and are not slit-like), short face placed largely below the braincase, narrow and simplified bony bar between orbits, olfactory lobes of brain reduced and optical lobes enlarged, haemochorial placenta (invades uterine wall and chorion directly bathed by maternal blood); E, partial or complete postorbital bar which separates the eye socket from the temporal opening, alisphenoid contacts zygomatic, anterior accessory chamber developed as a diverticulum from the auditory tube, internal carotid artery lies wholly within a septum separating the tympanic cavity from the anterior accessory chamber, functional stapedial branch of internal carotid artery absent, ventrally placed posterior carotid foramen rostral to fenestra cochelae; F ANTHROPOIDEA, large inferior orbital fissure, large sinuses in the maxilla and sphenoid, fused mandibular symphysis, expanded quadratic molars, molarization of the premolars (especially P4), strong development of the hypocone, canine occlusion, relatively large canines compared with incisors, lateral incisors larger than central incisors. hindlimbs, grasping hands and feet and long tail were presumably used for balancing during climbing. The teeth of adapiforms suggest a diet of fruit and leaves. The tarsiids also date from the early Eocene. The oldest possible relative of tarsiers is Shoshonius from Wyoming, USA, known from several tiny crania (Figure 11.2(g)). Shoshonius shares its very large orbits, short snout and some details of the braincase with tarsiers (Beard et al., 1991), although many of these features are also shared with omomyids (Rose, 1995). Unique features shared by Shoshonius and living Tarsius are the slight overlap of the basioccipital on to the auditory bulla, the presence of a ventrolateral posterior carotid foramen in the auditory bulla (site of passage of a branch of the carotid artery) and a ventrolateral suprameatal foramen (site of fusion of two arteries). Even if Shoshonius is an omomyid, the tarsiids are still the most ancient living group of primates: the next oldest fossil is a specimen of Tarsius from a middle Eocene fissure filling in China (Rose, 1995). The living tarsier (Figure 11.1(b)) is a small nocturnal animal that leaps from tree to tree in the forests of south-east Asia, feeding on insects, lizards and small birds.